Split is the editorial format of the Atelier Impopulaire artists’ collaborative project. It is conceived as a “split screen” that develops into a device splitted in two sides – namely, as a tête-bêche book. For each publication, two fellow artists are invited either to write two original texts, or to rework on unpublished essays focused on the political and aesthetical reflections carried out during the research on Atelier Impopulaire. Their publication will follow the split format: that is, a booklet in which two texts meet and multiply their own visions as if they were mirroring themselves, and at whose center lies an iconographic appendix. The second phase of the project expands the editorial device into the physical environment: the theoretical contents of each publication will be shared also through an installation and a performance. Atelier Impopulaire Split #1 consists of an original text by Bruce McClure, an architect and performer based in New York. 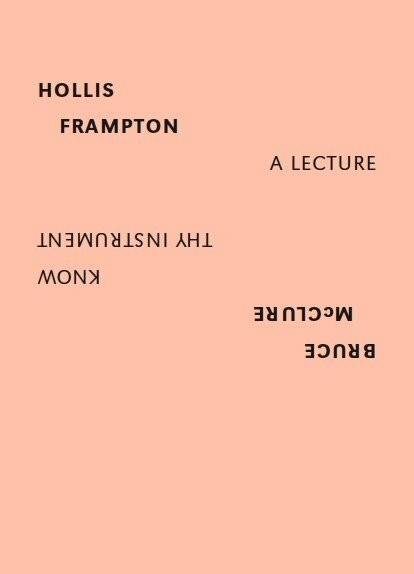 It is titled Know Thy Instrument, and based on a lecture given by Hollis Frampton on 30 October 1968, then published as A Lecture. Both with his text and projection performance, McClure aims at reflecting upon the body/technology dynamics, the relation with the whole projection apparatus, and the implications deriving from the removal of some of its parts. This all results in a modification of its mechanical structure, thus provoking a systemic abstraction of the obscurity/light duality in the guise of sound patterns.